by Audrey R. Jones and Larry A. Jones, M.D. 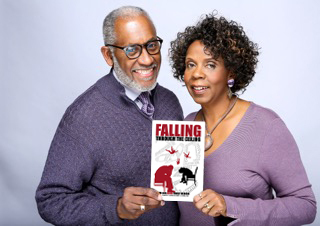 For us Falling Through the Ceiling is a blend of love, humor and real-life irony. We make sense of the nonsensical by shedding light on our challenges of living with attention deficit disorder (ADHD). Our stories are examples of the things that can happen when ADHD runs rampant and untreated for parent and three sons. That is what defines the universality of our stories. We fell into the same trap as many other parents, thinking that Drew, Jay, and Rob were just lazy and willfully not completing assignments in school. Parenting is probably the most humbling experience of your life. Few of us are trained in parenting and we encounter events in our children’s lives, which should lead us to professional counselors and therapists. Our darling children can throw us off kilter because they really do the darndest things. 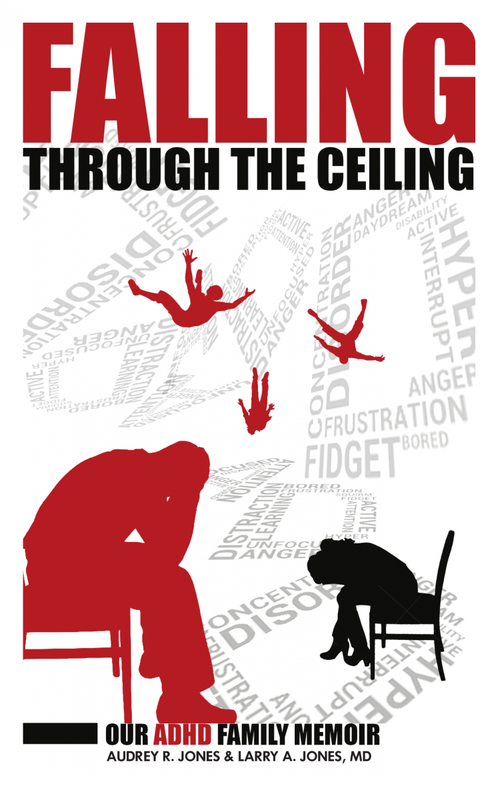 Falling Through the Ceiling: Our ADHD Family Memoir (available online at www.enabletables.com) offers a poignant look at the challenges encountered by both parents and children as they cope with attention deficit/ hyperactivity disorder (ADHD). Married over 45 years, Audrey and Larry Jones are parents, grandparents, and fun-loving mates who enjoy each other’s company, civic, volunteer and cultural activities and frequent traveling. They had a whirlwind spring romance in 1970 as college students, married in late summer of 1972, and in four years had three sons, one right after the other. Authors Audrey R. Jones and Larry A. Jones, M.D., are candid about the struggles their upwardly mobile, African American family endured with ADHD. Discussion or acknowledgement of ADHD in African American families has been historically taboo. The self-imposed stigma of having ADHD looms large, yet scholarly studies of the disorder often rely on personal and caregiver reports. Based on their own experiences, Audrey and Larry crafted a blueprint for discussing the causes and effects of ADHD and the ever-increasing possibilities through diagnosis and treatment. “Audrey and Larry Jones provide a sensitive, knowledgeable, and often humorous account of the obstacles inherent in raising children with ADHD. They describe their personal journey, from dating to marriage to parenthood and grandparenthood. Although they put their experience in the context of every family’s aspirations, they also highlight the unique experiences of black American families who are navigating the complex process of coming to terms with ADHD. This book will be an inspiration for the thousands of families who are confronted with ADHD,” said Elaine F. Walker, Ph.D., professor of psychology and neuroscience and director of mental health and development at Emory University. BPM: Talk us through your experiences as a self-published author. Why did you go down this route? AUDREY: Being serial entrepreneurs, we view managing the production and selling of our book and other media as a new business venture in our retirement. We have set up a publishing enterprise, ENABLE TABLES MEDIA, to work with other families to tell their stories. LARRY: This was the best way for us to control the printing and distribution process. We feel that we have a strong message to share with other families through our book, speaking engagements, and media outreach. BPM: Did publishing your first book change your thought process on writing? Was it a positive or negative experience? AUDREY & LARRY: We thought writing was just putting words and thoughts on paper. But sharing intimate details of our lives became positive because of our journey from the unknown to the known about ADHD and the positive outcomes of our sons’ lives. BPM: What is the most rewarding part of your artistic process? AUDREY: The journey has been so fulfilling because the exchanges with other parents made this story’s value clear. Every time I share the topic and our experiences, it’s clear that the message is a vehicle for hope. Whether the person is a parent, grandparent, or are affected themselves by symptoms that are associated with ADHD, they are engaged and express interest in reading our book. LARRY: We have an opportunity to encourage, strengthen and support families through the process of getting to the diagnosis of ADHD. We understand the emotional turmoil that families endure and their ongoing struggles to steer their gifted offspring to resilience. BPM: Was there an early experience where you learned that the written word had power? AUDREY: Writing the book was group therapy for our family, discussing and communicating openly with each other about our ADHD experiences. LARRY: The personal catharsis for Audrey and me has been uplifting and given us courage to discuss our story on a bigger stage. BPM: What is one of the things you’re most thankful for as a writer? LARRY: I’m most thankful to have a creative partner in this process for mutual support. AUDREY: I’m most thankful for our Sankofa experience. We have shared our lives working with ADHD and building on what we have learned. We are thankful that we continue to nurture our precious eggs, our sons and our marriage. Of course I’m thankful to finish the book to give hope to others to stabilize behaviors and become resilient. BPM: In your opinion, what’s the measure of a successful writer? AUDREY: Successful writing translates as reaching the targeted audience with useful information. LARRY: To me the measure of a successful writer is creating a story with universal appeal. BPM: If you could pass on any advice to authors out there reading this interview, what would it be? AUDREY: Pray for direction to understand your strengths as a writer and reach out to other industry professionals to help you tell your story. LARRY: Get lots of feedback from friends throughout the creative process. 1. What do you think is the premise of Falling Through the Ceiling: Our ADHD Family Memoir? I liked the metaphor of Falling Through the Ceiling. It may have helped the reader understand more had that story been presented at the beginning of the book. I kept wondering about the title. 2. Were there sections that were powerful or changed your perspective on ADHD? Every time there was discussion of Larry’s ADHD symptoms it was illuminating. I did not realize that one could be so successful in academics, career, marriage, family, and covering up. It will be inspirational for successful individuals to read about the challenges of another successful family. 3. Did you agree or disagree on the behavioral science presented? I did not attend to the behavioral science as much because you relayed it in a lay manner. This book should appeal to the lay public because it is the story of parents learning to deal with family issues. It also may benefit married couples. 4. Would you recommend this book to someone? I would recommend this book to successful African American families in particular because there are no books to help us to understand what can go wrong in our families. I believe we all struggle one way or the other and wish we could do it better for our children. I would recommend the book to K-12 teachers so they can develop a better understanding of the inter-generational aspect of ADHD. 5. Who do you think would enjoy or benefit from reading Falling Through the Ceiling: Our ADHD Family Memoir? As I said earlier, some of the problems you describe are similar for many African Americans in our generation who are first generation and tried to raise their children in ways that afforded them what was needed for success—the things we did not have. Your story sounded like others I have heard and the families may or may not have had ADHD. There are similarities to our family. Our son has a learning disability and we have “saved” him too often too. I believe educators would benefit from reading the book because it might encourage them to be more assertive in sharing more information about children with parents no matter the financial status of the parents if they realize that all may not be well in the households and the children’s welfare is at stake. Falling Through the Ceiling: Our ADHD Family Memoir, is a poignant book about the challenges encountered by both parents and children as they cope with attention deficit/hyperactivity disorder (ADHD). The authors, Audrey and Larry Jones, provide a sensitive, knowledgeable, and often humorous account of the obstacles inherent in raising children with ADHD. They describe their personal journey, from dating to marriage to parenthood and grandparenthood. Although they put their experience in the context of every family’s aspirations, they also highlight the unique experiences of Black American families who are navigating the complex process of coming to terms with ADHD. The authors take the reader through the early childhood years, when ADHD can result in academic frustrations and often dramatic childhood pranks. They then move on through adolescence and young adulthood, when, for youth with ADHD, the launch into independence can be fraught with more than the average obstacles. As the authors tell their family’s story, each of them stops along the way to reflect on the personal impact of the children’s challenges and to share their perspectives on how they might have handled things differently. This book will be an inspiration for the thousands of families who are confronted with ADHD. I enjoyed reading Falling Through the Ceiling and gaining the perspective of parents raising three sons with ADD/ADHD. I would recommend this book to parents as a helpful way of approaching parenting children with ADD/ADHD. I would recommend it to my clients raising children with ADD. The perspectives of Dr. Jones regarding his own diagnosis of ADD would be helpful to the many adults who discover late in life that they have been struggling to cope with ADD for many years. The chapter on enabling one’s adult children and ways to help them to become independent and cope with their attention deficits would be helpful for all parents attempting to help their adult children maximize their potential for having a productive and happy life. Falling Through the Ceiling: Our ADHD Family Memoir is an unabashed memoir of a family’s experience of red flags and ultimately red lights. It’s about proceeding without heeding the warning signs that suggest help is needed. It’s about identifying behaviors that call out for intervention and possibly psycho-social treatment. The premise of the book is an alert to parents to pay attention to the repetition of critical behaviors as noted in the section, “For Parents, Lessons from Our Lives”. I think this book would be helpful for any parent, it points out they are not alone, in spite of everything looking right, “should be right “, but is not right. I consider this book an essential read for parents who just can’t figure out why their child/children appear to have it all, but don’t do what they need to do, nor do they keep their promise. For the parents who have done everything they can think of to support, nurture and encourage their child/children, but to no avail, the child just does not seem to get it. I strongly recommend the reading of this book. In doing so, parents may emphatically recognize themselves in the many shared stories and, thereby, come to their own “aha”. I have just completed reading Falling Through The Ceiling and I am still breathless. The central theme of the book — sharing lived experience, with honesty and lessons learned– is wonderful. As we all struggle to raise our children and our grands, as we struggle to understand and get better, nothing is more valuable than shared experience from those who traveled the road before you. The additional beauty and value of Falling Through the Ceiling is exquisite storytelling around difficult and clearly painful subjects. Dr. Larry and Audrey Jones are wonderful storytellers, making the book a pleasurable as well as informative read. There are many things in the book that changed my perspective about ADHD. For instance, I had no idea that there was a spectrum along which the disability travels. I learned that hyperactivity can show up in many ways, including disconnection or disjointed reasoning. I was particularly moved by Dr. Jones discovering so late that he too had a form of ADHD, particularly when thinking about what his struggle through college and medical school must have been like. I was wowed by the commitment and teamwork — even in concealing some of the negative effects of the disorder on their family– of Dr. Larry and Audrey Jones. As I understand the science of personality disorder or mental illness I think this book is a very good depiction of the interplay between science and society. I also thoroughly enjoyed the race specific observations and analysis. Refreshing! This is a beautiful offering from authors Dr. Larry and Audrey Jones. Falling Through the Ceiling is such an important story which many families and support villages will benefit from reading. Awareness is so important. I especially enjoyed the neuroscience aspect of the book as it relates to ADD and ADHD. The title is spot on, especially in regards to sharing money and the difficulties of navigating life, as well as the emotional rewards gained through being able to teeter totter and continue onward. “I was a multitasker because I was forced to be, I had so many things to do, and because I felt responsible for nearly everything. I felt like I was Falling Through the Ceiling some days just trying to cope. I am admitting this today because what I did was wrong. I want someone else to do right. Let’s face it: I was the Enabler. Not dealing with the underlying issues, but fixing urgent problems in the moment is what I did as my children grew up and my husband worked. They relied on me. I took care of all of them. It all changed one day when I could barely take care of myself. Everyone nearly lost it due to my unexpected illness, which happened as a result of me not taking care of myself. My condition forced me into disability in 2008. I could no longer manage a business—because it takes multitasking to do that. I had successfully owned and operated airport concessions and retail locations throughout the region for 24 years, while simultaneously managing my husband’s medical practice for most of those years and co-parenting our three sons. My short-term memory was almost completely shot. Long-term memory, speech and speech comprehension were all affected. I couldn’t even finish a sentence on some of my worst days. When it all collapsed, for a time, I was unable to function without written notes. I missed appointments and even airplanes when I didn’t write things down. More than simple notes, I had to create outlines to function, describing what each task was supposed to look like, similar to creating a quilt one little square at a time. “It took time, plenty of therapy and earnest prayer to get through those years. The good news is that my liver is restored; it began regulating again, reducing the toxins in my brain. I have partial restoration of my faculties—not a whole lot, but some. Since I had survived, I came up with some workarounds to keep going, so things like taking copious notes continue to help me. When it comes to being the Enabler, I remind myself that my life, mind and body are on the line—literally as serious as life and death for me—so I handle things differently. In the past few years I’ve gotten better, thank goodness. Now when my sons call me with a problem, I just say, “No, I don’t know the answer, but I’ll look it up.” (That’s a joke! They have learned it means I’m expecting them to figure out things for themselves.) If it’s a real problem, I apply the tools/methods I’ve learned to help them figure out the problem themselves. If I could go back, I certainly would do things differently. However, I did the best I could with the Jones Boys and my husband. 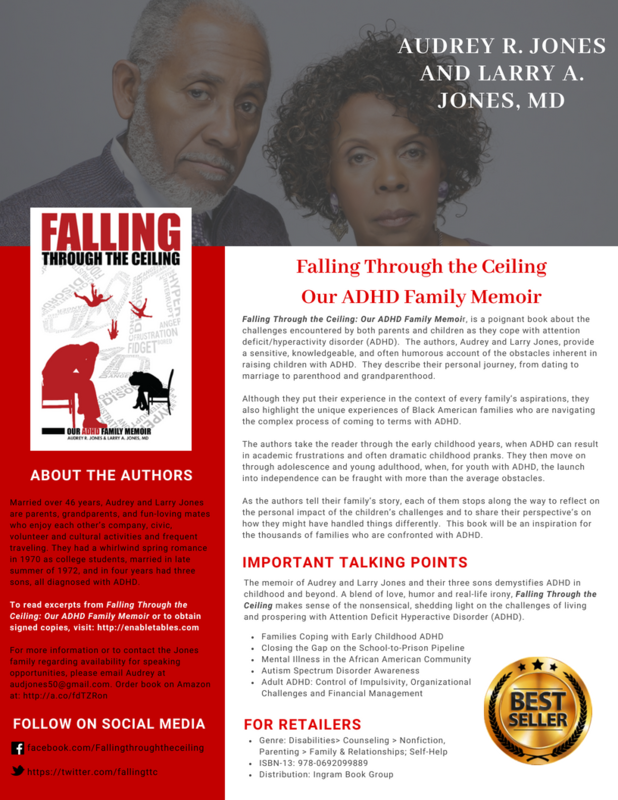 © 2018 Falling Through the Ceiling: Our ADHD Family Memoir by Audrey R. Jones and Larry A. Jones, MD. Published by Enable Tables Media a Division Of Smart Management Inc. No part of this book may be reproduced in any written, electronic, recording, or photocopying form without written permission of the publisher. The exception would be in the case of brief quotations embodied in critical articles or reviews and pages where permission is specifically granted by the publisher. Although every precaution has been taken to verify the accuracy of the information contained herein, the author and publisher assume no responsibility for any errors or omissions. No liability is assumed for damages that may result from the use of information contained within. Books may be purchased in quantity by contacting the publisher directly: Enable Tables Media, a division of Smart Management Inc.
For at least 20 years of his career as a pediatrician and parent, he did not link his children’s symptoms and signs of ADHD to himself. While being an effective and popular clinician, he lived in denial about his own diagnosis. Larry is currently a departmental medical director for the SSM Healthcare System. With treatment and counseling, Larry is pursuing community projects, including facilitating a STEM program with elementary school students in Ferguson, MO. We have begun institutional sales and group sales through school districts to assure wider distribution and access to clinicians, social workers and therapists. This is in addition to our ongoing work to provide FTTC to college and university libraries across the country. If you would like to sell our book at your store or have it placed in your library, please contact us by email at audjones50@gmail.com or by phone at 314-443-6705. For quantity discounts, please contact us for direct orders at (314) 443-6705 or audjones50@gmail.com. Dr. Jones, after 24 years as a practicing pediatrician, successfully living with ADHD, will be completing his training as an ADHD Life Coach. With this certification, Audrey and Larry will package their expertise as: Stop Failing and Falling Coaching. Online, Larry will provide services to connect affected people and their families with medical, educational, and support resources accessible to them locally. He will continue to be available for local, individual coaching. Larry and Audrey will also continue speaking on Hope, Healing, and Resilient living. Check out WWW.ENABLETABLES.COM to schedule coaching and group events. Create a Pearl Page Like This One in Minutes! Got a ebook or a new printed book...let us tell the world it's available! Reserve your own personal audio book preview page today and your Pearl Page will be ready for syndication in 3-5 days! Let us share your message with our database for the next 3 months.The bookcover (with link to bookseller) is showcased on Black Pearls Magazine front page sidebar for 3 months too. Pearl Pages are emailed to more than 165,000 readers of the EDC Creations newsletter, played on BAN Radio Show 3 times in 3 months and promoted via our mobile bookclub. View here. What a way to share your audio-visual introduction with readers! Fee: $79.00 for complete webpage and audio. Make all payments at the EDC Creations Payment Center, go here today. We look forward to sharing your information with our network! Ella will email instructions within 24-48 hours.